The lifestyle in Wakanda is exactly the lifestyle for you. You love the open, friendly community and having the benefits of vibranium would be awesome. If you can't get to Wakanda (and unfortunately you can't since it only exists in the movies) then bring Wakanda to you. 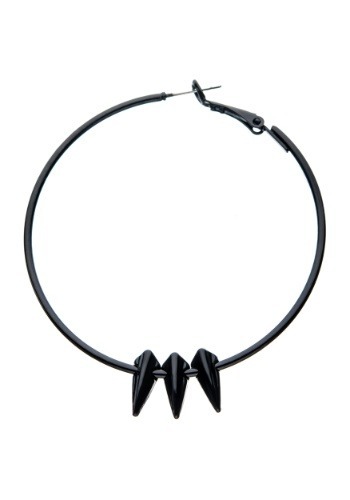 The Black Panther claw hoop earrings are a subtle way to bring T'Challa's vibe to your everyday ensemble. Fans may recognize the claws right away, but they're also delicate enough that you can wear them without detection, just in case you have an unfortunate and unexpected meet-up with Thanos. This small accessory packs a superhero-sized punch to any ensemble you choose to pair them with. Show off your Marvel fandom with the stainless steel hoops. The stylish hoop style earrings are officially licensed and close behind the ear with an attached clasp. On each hoop earring, there are three dangling claws in the middle of the hoop. Since your such a Wakanda fan, you'll want to add to your Black Panther collection. If you love these earrings, check out Loungefly's faux leather handbag as a way to assert your MARVEL-ous style. Of course, these earrings look great with any Black Panther costume you choose.